ALEXIS (ALEXIUS, ALEXIOS) the Man of God, (Early Fifth Century), a native of Rome, who, most likely, with the consent of his bride, left her at the altar to devote his life to serving God. He is said to have left Rome and settled in Edessa. There he entered a monastery and spent close to two decades in prayer and writing on various aspects of Christianity. His fame grew and seeking to continue a life of anonymity, St. Alexis returned to Rome, where he spent the rest of his life, living, unrecognised, on his parents’ estate, as a simple beggar. When he felt death drawing near, St. Alexis wrote a letter, which was found following his repose, to his family in which he revealed his true identity and his love for them. The title ‘Man of God’ is generally said to have been bestowed upon him by either an icon or vision of the Theotokos, who in calling attention to his devotion in Edessa, used that appellation. ANDREW ZORARD, a Pole who was a missionary in the area of Olawa, Silesia (present-day Poland), and later lived as an anchorite on Mount Zobar in Hungary, where he reposed circa 1010. CYNLLO, St. Cynllo seems to have been a late fifth century Welsh saint, though there is no reliable information on his life extant. There are several churches dedicated to him in Wales. According to a local tradition, his knee imprints are in a rock near Felin Gynllo farm, just outside of Llangoedmor in Ceredigion. ENNODIUS (Magnus Felix Ennodius), a well-educated Gallo-Roman whose wife was from a wealthy noble family. After recovering from a serious illness, St. Ennodius dedicated the rest of his life to the service of the Almighty. He was ordained to the diaconate, and his wife retired to a monastery. In 510, St. Ennodius was consecrated Bishop of Pavia. He was appointed a Papal Legate to Emperor Anastasius I Dicorus (r. 491 - 518) in Constantinople where, on two separate trips, he endeavoured to convince the emperor to repudiate Eutychianism. On his second trip, St. Ennodius was met by violence and only just managed to escape with his life. He was a prolific writer, and some of his works are still extant. St. Ennodius reposed in 521. FREDEGAND (FREGAUT), a disciple of St. Foillan (31st October) and later Abbot of Kerkelodor near present-day Antwerp in Belgium. He reposed circa 740. GENEROSUS, (Date Unknown), venerated in Tivoli as a martyr where his relics are enshrined in the Cathedral Basilica of San Lorenzo the Martyr. Nothing further is known of St. Generosus’ life. KENELM, the son of Coenwulf, King of Mercia in England. According to most common legends, all of which are based upon a twelfth century manuscript at Winchcombe Abbey, St. Kenelm, at the age of seven, was murdered by beheading at the instigation of his sister Cynefrith who sought to assume the throne. His body was buried in an unmarked location in the Forest of Clent. Kenelm’s soul is then said to have arisen in the form of a dove carrying a scroll, which flew to Rome where it dropped the scroll at the feet of the Pope. The message on the scroll read: ‘Low in a mead of kine under a thorn, of head bereft, lieth poor Kenelm king-born’. The Pope then wrote the Archbishop of Canterbury, who commissioned a party from the Mercian capital, Winchcombe, to seek the body. As they searched, they saw a pillar of light shining over a thicket in Worcestershire. Buried beneath it they found the body of St. Kenelm. The monks transported his relics to Winchcombe Abbey, where they were enshrined, and remained for several hundred years. However, the wider historical record supports none of this. St. Kenelm was most likely aged twenty-five when he reposed from unknown causes. His sister Cynefrith, who had received monastic tonsure at the time of her father's death, was the Abbess of Minster-in-Thanet at the time of her brother’s repose (circa 821). Regardless of the accuracy of the legend, St. Kenelm was universally venerated as a saint and martyr in Mediæval England. He is mentioned in the Canterbury Tales (the Nun's Priest's Tale, lines 290–301), and twelfth century English historian William of Malmesbury recounted that "there was no place in England to which more pilgrims travelled than to Winchcombe on Kenelm’s feast day". MARCELLINA, the elder sister of St. Ambrose of Milan (7th December) and St. Satyrus (17th September). St. Marcellina received monastic tonsure from Pope Liberius (r. 352 – 366) though she never entered any monastery, living instead in private homes. She also served as an assistant to her brother following his consecration as Bishop of Milan. St. Marcellina reposed circa 398, her relics were enshrined in the Basilica of Ambrose in Milan. SCILLITAN MARTYRS, twelve martyrs, seven men and five women, who suffered at Scillium in Numidia in 180 by order of the proconsul Saturninus, for refusal to renounce Christianity. Their names are: Speratus, Narzales, Cythinus, Veturius, Felix, Acyllinus, Laetantius, Januaria, Generosa, Vestina, Donata, and Secunda. The Acts of the Scillitan Martyrs are considered to be the earliest documents of the church of Africa and also the earliest specimen of Christian Latin extant. THEODOSIUS, the Bishop of Auxerre from circa 507 until his repose circa 516. 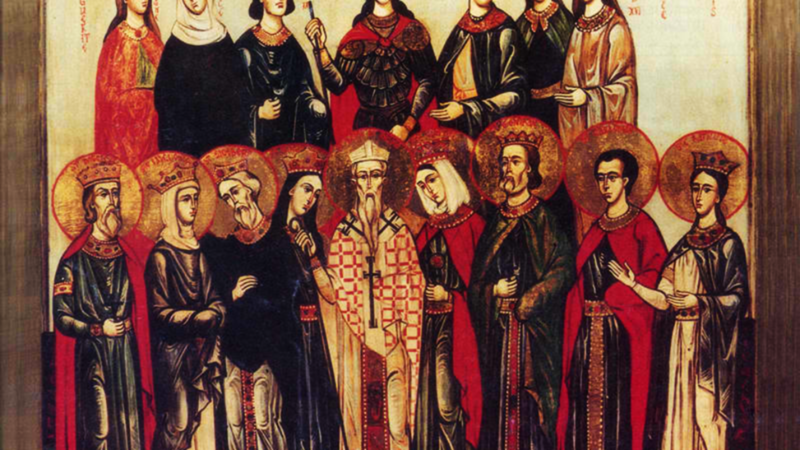 St. Theodosius is listed amongst the attendees of the Council of Orleans in 511. TURNINUS, (Eighth Century), an Irish missionary priest and fellow worker of St. Foillan (31st October) in Flanders.